Only the Schmidt Offset Coupling, which requires a minimum offset, offers so much flexibility in shaft displacement while maintaining undisturbed power transmission at constant angular velocity. The coupling does not add secondary forces to the drive. It also will not transmit radial vibration between the drive and the driven shafts. It is a dynamically clean drive which will help provide a smooth flow of power for maximum product quality, and, unlike universal joints, there is no performance loss by increasing shaft offset. Standard Schmidt Offset Couplings are available for parallel shaft displacement from a minimum of 4 to 440 mm and torque capacities from 6.2 to 51864 Nm. Special coupling sizes can be manufactured for any specific customer requirement. The L100 series couplings will handle parallel shaft displacement from a minimum of 4 mm to a maximum linear shaft displacement of 77 mm with torque ratings from 6.2 to 146.8 Nm and shaft speeds up to 4000 RPM. The L100 series is especially suitable for applications in business machines, optical, electronic equipment and robotics. The L200 and L300 series couplings are capable of handling parallel shaft displacement from a minimum of 11 mm to a maximum linear shaft displacement of 440 mm with torque ratings from 71.9 to 51864 Nm and shaft speeds up to 2500 RPM. The L200 and L300 series are equipped with caged type needle bearings. The shafts are hardened and serve as the inner race of the needle bearings. The coupling can be mounted on shaft hubs or directly to existing flanges. This mounting technique permits installation of the offset coupling without any need to move either of the shafts being coupled. The Schmidt Offset Coupling has a slight built-in axial freedom to compensate for thermal shaft expansion and assembly tolerances. The maximum angular shaft misalignment should be kept under one-half (%) degree. 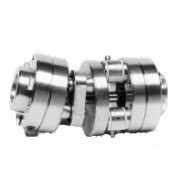 Schmidt Inline Couplings are of the torque-rigid type, designed with two pairs of parallel links installed 90 degrees out of phase with each other. This patented arrangement allows for the precise transmission of torque and constant angular velocity between shafts with relatively large parallel misalignments. The coupling utilizes needle bearings which can be preloaded for "zero" backlash conditions. Typical applications which benefit from the high accuracy provided by Schmidt Inline Couplings are feeders, embossers, compactors, printing presses and many others. Schmidt Inline Couplings are available for a torque range from 56 to 2824 Nm. 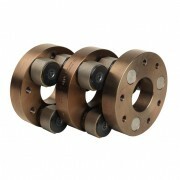 Couplings for higher torque requirements are made available on special order. Schmidt 5-D Couplings were developed to fill a gap in the family of torque-rigid couplings. Most couplings in this family are designed to accommodate either axial, angular, or parallel shaft displacements only. For some applications, however, the operational conditions require all possible shaft misalignments. If these shaft misalignments exceed the limit of the selected coupling capacity, excess sideloads are introduced into the equipment which can cause vibrations, life reduction or failure of vital machine components such as bearings, motors, etc. The 5-D Couplings, are a modification of the Schmidt Inline Coupling, designed to accommodate all 5 degrees of shaft displacements. This patented coupling allows easy adjustment to any possible misaligned shaft position without imposing heavy sideloads on shafts, bearings or other machine equipment. 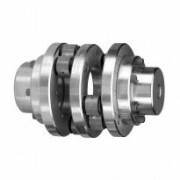 Schmidt 5-D Couplings offer large shaft misalignment capabilities and constant angular velocity. The acting forces within the coupling can be precisely calculated, assuring a sound coupling design which is especially important for heavy-duty applications.